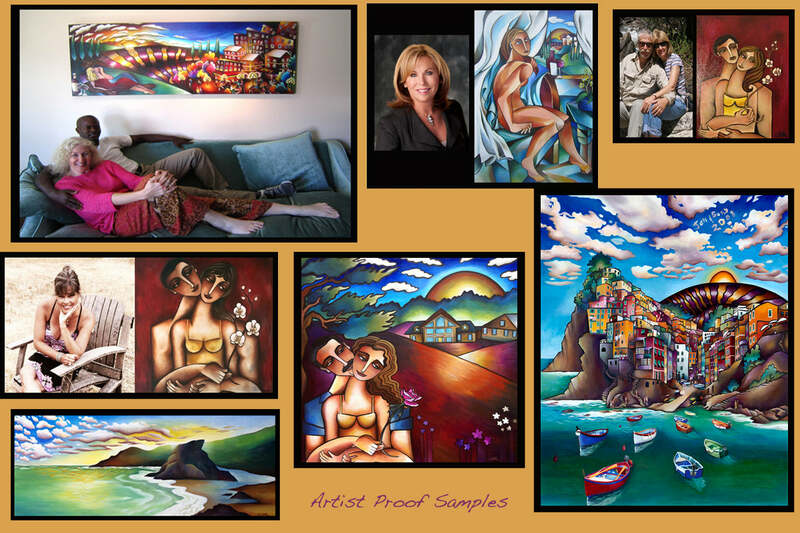 CLAIR's Signed and Numbered Canvas Giclees are printed on canvas and signed and numbered by the artist.. By printing on canvas, the colors achieved are mirroring the intensity, vibrancy and color of CLAIR's originals. Our canvas giclees are stretched on heavy duty stretcher bars and are museum wrapped (the painting continues around the sides), adding a three dimensional studio feel and creating the option to hang them unframed for a more contemporary look. Each one is signed and numbered on the back. Please note each giclee is printed per order. See some other artist proofs I have done HERE! Our canvas Mini's are perfect for those small spaces, or great for giving as gifts. They are also wonderful in a grouping of 3 or 4 for a greater impact. They are stretched on light stretcher bars , so they are ready to hang as soon as you get them home. They are printed in an open edition. In the giclee process, the image is generated from a high-resolution digital scan and printed with UV inks onto archival quality canvas. An ultra-fine stream of non-toxic water based ink, more than 4 million droplets per second, is jet-sprayed onto the canvas. This produces a combination of over 3 million possible colors resulting in prints that are lush and vibrant with the look and tonality of a fine art oil painting. Limited-edition giclees are signed and numbered on the back. Giclee prints have gained worldwide acceptance in the art community and can be found at the Metropolitan Museum of Art in New York and the Louvre in Paris. Giclees and Mini Canvas Giclees will arrive within 2-4 weeks. Artist Proof Giclees will arrive in 4-6 weeks. If you have any questions, please feel free to contact us at steph@stephanieclair.com or ask for Mark at 858 549 7299.